Weird Tales by Women Writers | Vault Of Evil: Brit Horror Pulp Plus! Part I of an imaginary anthology of standout tales from the Unique Magazine. This installment covers some of the most obvious authors. It makes sense to begin with La Spina, the first women writer to play a prominent role in WT's pages. Her masterpiece may be The Devil's Pool (1932), a werewolf story that hasn’t seen the light of day since Robert Weinberg included it in Lost Fantasies #3. Many, but not all, of the tales that Pendarves wrote for WT are collected in Thing of Darkness. Most are conventional “psychic investigator” stories. Her work is more interesting when it deviates from this formula. I'm having difficulty choosing between her best-known story, The Eighth Green Man (1928; it's told in such an over-the-top style that it shouldn't work—but it does, somehow, exclamation points and all) and the lesser-known The Withered Heart (1939), which takes her typical approach and then gives it a nasty, no-happy-endings-here edge. All of Moore's WT stories are readily available, so the only question is whether to go with a Northwest Smith story or a Jirel of Joiry story. Given that Northwest seems to get more attention, my vote goes to a Jirel tale: Hellsgarde (1939), which leans more toward horror than science fantasy and features a highly original concept. Counselman wrote 30 stories for WT, so there are plenty of options here. Many, but not all, are collected in the various editions of Half in Shadow. My personal favorite among the ones I've read is Parasite Mansion (1942), a poltergeist tale that emphasizes the scares more than most of her work. I’ve read all of St. Clair’s WT stories except for two. Both of those are short pieces, anyway. I’m tempted to go with Island of the Hands (1952) because it hasn’t been reprinted (to my knowledge) since 1964, but Brenda (1954)—with its disquieting portrayal of a girl who’s fascinated by a strange not-quite-human thing trapped at the bottom of a pit—is just too good to pass over. Thanks ever so for introducing such an intriguing challenge! Have come up with a short-list of eighteen so far, including a story apiece from each of the above bar G. G. Pendarves whose The Eighth Green Man i've read, seem to have hugely enjoyed, but can remember nothing about, and The Withered Heart is yet another bloody story to track down. Settling on just the one story apiece to represent Mary E. Counselman and Margaret St. Clair is a headache, but we're agreed on the Greye la Spina, yet another brilliant story i would never have experienced were it not for the mighty Robert A. W. Lowndres and his peerless Startling Mystery Stories. I'm looking forward to seeing your list. In the meantime, my second round includes five more authors who were prolific contributors to Weird Tales. I have a hunch that at least one of your "all-time heroines" is among them. Morgan (a.k.a. Grace Jones) is probably best known for her favorite plot: human brain(s) transplanted in the body of animal. It seems a shame to choose a tale of hers that doesn't use this theme, but my selection is The Wolf-Woman (1927), which features a female vampire of the snowy North along with her pack of white wolves. Morgan wins bonus points for the inclusion of a real live mammoth. Of all the stories that Worrell wrote for WT, I've only managed to find and read three. She's long overdue for a collection. The werewolf tale Norn (1936; written under the pseudonym "Lireve Monet") has its proponents, and rightfully so. The Canal (1927) is one of my all-time favorites, however; it surrounds its tale of vampiric seduction with a wonderfully lush atmosphere of darkness. Truly one of the unsung contributors to WT, Harding (a.k.a. Jean Milligan) published numerous tales in the magazine--of which only a handful have ever been reprinted. Among the six I've seen, my top two are The Damp Man (1947) and The Underbody (1949). The former is great fun, with its comic book-style super-villain, but the latter gets the edge for packing a greater punch. A bleak tale about a dirt-covered, corpse-like mole man who entices young boys to "take a walk" with him, it would carry a nasty edge even without its supernatural overtones. It's never been reprinted, at least to my knowledge, but you can read it online at Unz.org. Quick doesn't get much attention these days, but she had a good run in WT; plus, she was reportedly friends with Mark Twain. I've read four of her fifteen stories in the magazine, though it's difficult to choose a standout among them. I'll leave it as a coin toss between [red]The Cracks of Time[/red] (1948), in which an image of Pan drives the narrator to madness and murder (or does it? ), and More Than Shadow (1954), in which a seemingly cute little dog serves as the agent of the child-snatching Fair Folk. This one has me stumped. Colter (a.k.a. May Eliza Frost) wrote at least a dozen stories for WT, but I've only read two. I can't say that either The Golden Whistle (1928) or The Man in the Green Coat (1928) made much of an impression on me; even looking back over them doesn't help. Both are included in Forrest J. Ackerman's peculiar color-themed anthology, Rainbow Fantasia, if anyone is curious about them. It seems as though Colter should be represented, so I'm open to suggestions. Next up: A set of authors who published only a few--or even one--story in WT but made a lasting impression nonetheless. In the meantime, my second round includes five more authors who were prolific contributors to Weird Tales. I have a hunch that at least one of your "all-time heroines" is among them. And you'd be right! I've still not settled on a story to represent the great lady, though it will most certainly be one of the notoriously barking brain transplant extravaganzas, not that there's anything lacking in the others! The Eli Colter i'd go with is The Last Laugh which, depending on your viewpoint, is a commendably cry for racial tolerance at a time when Weird Tales was more inclined to print the appalling likes of Arthur Woodward's Lord Of The Talking Heads, or so awesomely patronising toward black people that, to the modern reader, it defies credulity. I prefer to accept that it was written with a good heart, and, in the WT scheme of things, is of significant historical importance. Like Mary E. Counselman, 'Bassett Morgan', and at least two more of my selections, 'Eli'/ May was represented in Christine Campbell Thomson's Not At Night series, so, you know, little further endorsement required. You've uh, sussed heroine #2, haven't you? Everill Worrell. i've gone with The Gray Killer over the wonderful The Canal simply because it's not been anthologised anywhere near as often. Have never read anything by Dorothy Quick (! ), and the very few Allison V. Harding's to come under the demonik microscope are surely no match for The Underbody. Looking forward to making the acquaintance of this "Corpse-like mole man"? How comes nobody thought to mention him before! Have you settled on the cover artist, and if so, which example of her work? I was 99% certain that the inestimable Morgan was one of the two. I haven't had the pleasure of reading Worrell's "The Grey Killer," so I can't speak to that one. Given how scarce Thomson's original anthologies seem to be, I'm guessing that Lowndes' Startling Mystery Stories would be my best bet for finding a copy. It would be good to include a less-anthologized story for Worrell given how "The Canal" seems to get all of the attention coming her way. The Colter story would be "The Last Horror," correct? I haven't read it, but Robert Weinberg's The Weird Tales Story includes a detailed description of it. At the very least, it would be of historical interest. I just read "The Underbody" for the first time today. I'm amazed that nobody has ever anthologized it (Weinberg even singles it out for mention in TWTS). Glad you asked about the cover artist--I've been assuming Margaret Brundage, the trick is finding one of hers that hasn't been used already. Hmm, could it be "Flavia Richardson," whose "Out of This Earth" appeared in WT? Dammit, The Last Horror. That will be me trusting to memory again. Invariably fatal. The Last Laugh is a C. Franklin Miller Carry on up the jungle horror, again selected by Christine Campbell Thomson/ 'Flavia' who you quite correctly identify as mystery heroine #2 (a second story, The Gray Lady, appeared in the October 1929 issue). Not sure if C. Franklin Miller is a boy or a girl so we may have to look elsewhere for our safari shocker. As to the cover art, it will be difficult to come up with something to top the perhaps too obvious but supremely appropriate masterpiece that is MARGARET Brundage's cover for the January 1938 issue. As to the cover art, it will be difficult to come up with something to top the perhaps too obvious but supremely appropriate masterpiece that is Marion Brundage's cover for the January 1938 issue. Agreed, particularly given that it illustrates a story by one of the authors mentioned above, Dorothy Quick (too bad I haven't read the story!). The first illustrates a Bassett Morgan tale (haven't read that one either); the second, a G. G. Pendarves tale (which I have read, and which uses prose that's even more purple than her usual style). I prefer the January 1938 cover, however, because it's "weirder" than the January 1935 one and doesn't feature a cowering woman like the August 1937 one. They are all very beautiful as is this from November 1936 (haven't read the story it illustrates). Much jostling for positions on my shortlist of suggestions. last minuted crisis when one of my nominees was outed as a man. A few to be getting along with. Evangeline Walton - At The End Of The Corridor: (May 1950). To best of my knowledge, Evangeline had just the solitary story published in Weird Tales, so lucky for us it's a bloody good one. It's a tough call with Mary Elizabeth Counselman but eventually I decided on The Smiling Face (Jan. 1950) over The Accursed Isle, though you'll not find me pulling faces at either of your selections. Pearl Norton Swet - The Man Who Never Came Back: (Weird Tales, July, 1932): "Subhuman, revolting, the lowest thing in the horror-ridden country of the jungle!" Were-leopard mayhem on the West Coast Of Africa. Young, naive shipping clerk Herbie Tillson is a catalogue of wonder to his colleagues at the company's Guinea base on account of his cats eyes, extra toe and ill-advised friendship with a member of the M'Bano tribe, a people so horrible even their own race will have nothing to do with them. When their house-boy's wife is mutilated by a wild beast, the man decide it's time to ship Herbie back to England. But they're too late, like the M'Bano he's tainted with lycanthrope, and the Swabi forest ilives up to its reputation as "the white man's graveyard." 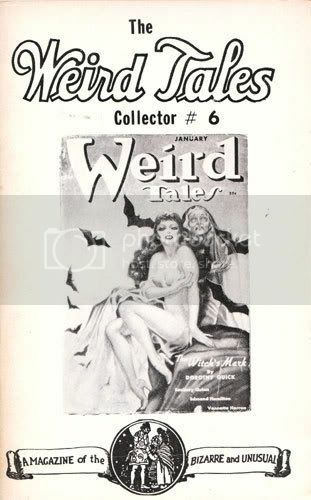 Perl's other contribution to Weird Tales, The Medici Boots (Aug-Sept 1936: you can read the entire issue in facsimile at Scribd., and there's a text version of the story attached at foot of this post) has a touch of the August Derleth's about it. Silas Dickerson, globe-trotter and collector, leaves his vast fortune and entire contents of his museum to his surviving relatives, the three young Delameters, to disperse as they please. His only stipulation. "The Medici boots of ivory leather must either be stroked or be put for ever under glass in a public museum. I prefer that they be destroyed, for they are a dangerous possession. They have gone to the adulterous rendezvous celebrated in the scandalous verses of Lorenzo the Magnificent. They have shod the feet of a murderess. They were cursed by the Church as trappings of the Devil, inciting the wearer to foul deeds and intrigue." Naturally, the flighty Suzanne can't resist slipping them on just this once. Thanks JoJo. Sobriety. it just don't agree with me at all. I have to say that with the exception of Moore I never read one of these writers. I know the name of Allison Harding of course, I have seen the name on the covers of WT. Are there any more infos about the ladies? Were those professional writers who did this for a living, writing in all genres, or did they just like horror? Did they see themselves as horror writers? Margaret Brundage Weird Tales, Jan. 1938. The final issue of Robert Weinberg's magazine features a rather sweet interview with Mary E. Counselman - who wrote her first ghost story at the age of six - in which she speaks with enthusiasm of her experiences of Farnsworth-Wright, Dorothy McIlwraith and her fellow authors, and it's clear she regarded herself as not only a macabre author, but a proud member of a tribe. "Seabury Quinni influenced me more than any other writer. He was almost my mentor. He introduced me to his distant cousin, Greye la Spina ... they both introduced me to Harold Lawlor. We corresponded almost weekly, like two old back-fence gossips. And, of course, August Derleth was the mentor of us all." 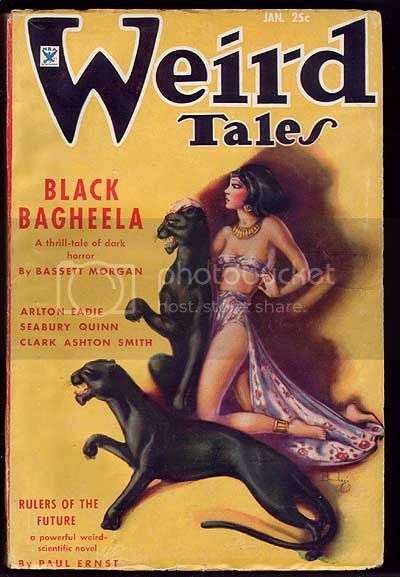 'Bassett Morgan' was maybe a more typical case in that she also wrote for the Adventure and Oriental pulps. Pearl Norton Sweat seems to have been a genre-hopper, possibly only ever published the two macabre stories mentioned above. Margaret St. Clair also wrote S F and fantasy. I've not researched it, but my guess would be that the depression-era women in particular were typical pulp authors of the day - if there was a paying market for it, they'd write it. Another good resource for info on some of these authors is the blog Tellers of Weird Tales, which seems to have a particular focus on women who wrote for the magazine. If I'm remembering correctly, La Spina tended to write for one magazine at a time--first The Thrill Book, then WT. Pendarves wrote for both WT and Oriental Stories. Colter was another genre-hopper; I think she also wrote for Western magazines. 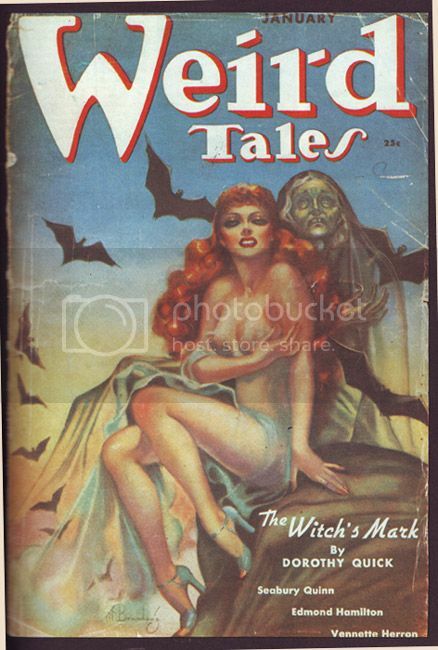 Worrell apparently focused her efforts on weird stories, though she did publish in other magazines such as Ghost Stories. Harding seems to have devoted all of her energy to WT.